RTÉ PRESENTER RYAN Tubridy has welcomed TV3′s ‘teaser’ version of the Late Late Toy Show which airs an hour before his own, saying “it’s going to be a great show”. Speaking during a brief unveiling of the show to members of the media, Tubridy said “As Lucy [Kennedy] has been saying, it’s a half hour teaser, it’s a bit of fun, and it’s the same every year – it’s toys, it’s kids, it’s fun”. Tubridy also says that one of the things he loves most about his show is when toys break on set and “when things get weird”. The TV3 show will air tonight at 8pm and will last 30 minutes, compared to RTÉ’s start time of 9.35pm and a duration of over two hours. RTÉ puppet Dustin the Turkey is set to co-host the TV3 show with Lucy Kennedy, another former RTÉ star. When Tubridy was asked if he will be watching the TV3 ‘teaser’, he replied with a smile: “I’ll be rehearsing”. How could you knock a toy show? It’s impossible, wherever it’s on and whoever is doing it. It will be great, I wish everyone well. Yeah I think they’re really important, of course. I was a kid once, and I was involved in kids programmes. So yes, of course they’re important. Tonight is your night because there are too many rules. This year’s Toy Show is said to be bigger and better than any previous year – and from the look we got of the set yesterday, that doesn’t seem to be an exaggeration. Speaking to the media yesterday, Tubridy unveiled the theme and gave an insight into the opening number, saying that his costume would be “cumbersome”. Opening sequence this year will be a big mammoth production (without the mammoth), but there will be an elephant – it’s The Jungle Book. “It’s good, it’s jazzy, it’s brassy, it’s sassy and it is the most colourful of all the openings I can recall. The set’s great, the music’s from the Jungle Book, you’ll all be able to sing along and tap your feet. He says that the momentum driving the Toy Show has grown and the Christmas show has “just exploded, it’s kind of out of control (in a good way)”. He says that one of the things he loves most about the night is when toys break on set, “because that’s real”. Toys don’t work on Christmas Day, a lot, and Santa sometimes gets it wrong and the elves sometimes make the wrong toys – and we reflect that. I love it when things get weird. But after eight years of hosting the Late Late Toy Show, the most-viewed show for RTÉ in the past 16 years, the host still gets nervous every morning before the show. And why wouldn’t you, when you’re hosting a live nationwide broadcast involving a room full of children and toys a few weeks before Christmas? “The way it is, it’s a small island and you’ll get over a million and a half people watching you, so while you might be a big show-off – it’s still daunting to think of that. So what I do is I pretend it’s not happening. I don’t pay too much attention, I just do crazy things with a bunch of kids so if there happens to be cameras around, so be it. And all of those activities certainly take a lot of energy and a lot of preparation for Tubridy. The Late Late Toy Show airs tonight at 9.35pm on RTÉ One. Email “Ryan Tubridy welcomes TV3's 'teaser' Toy Show ahead of tonight's Late Late”. 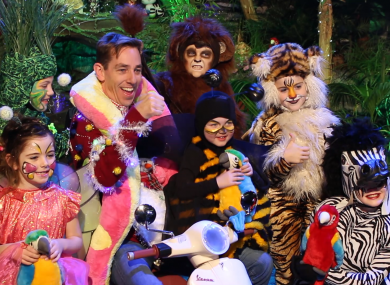 Feedback on “Ryan Tubridy welcomes TV3's 'teaser' Toy Show ahead of tonight's Late Late”.